In 1967 Congress passed the Wholesome Meat Act, Public Law 90-201, amending the Federal Meat Inspection Act. The act expanded the federal government’s authority over meat slaughter and processing to intrastate commerce but did create exemptions from the requirement that an inspector be present when slaughtering is taking place. The Wholesome Meat Act allowed the “uninspected” slaughter of meat animals at a custom facility as long as the owner of the animal did not resell the meat and distributed only to members of his family, employees, or non-paying guests. The owners of the animal must be established at the time slaughtering takes place. The custom and on-farm slaughter exemptions are codified in 9 CFR 303.1. The regulation allows an unlimited number of owners for a custom processed animal but the owners must be individuals, not an entity such as a food buyers club or a cooperative. 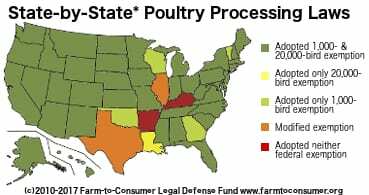 Around ¾ of the states allow for an unlimited number of owners of a custom processed animal; this allowance is especially important for farmers who live in states where there is no state inspection program. 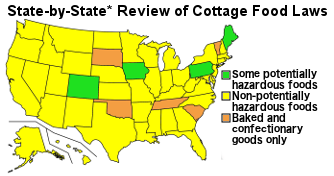 USDA’s Food Safety Inspection Service (FSIS) takes the position that there should be a minimum portion of the animal each individual owner should receive but the agency is not specific on what that portion should be. States can adopt their own standards for custom and on-farm slaughter but they must be at least as strict as the federal guidelines. 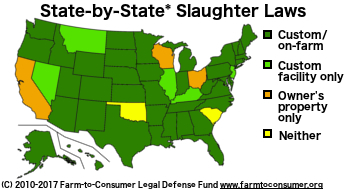 Farmers slaughtering and processing animals they have raised for their own personal consumption is legal in every state so this is not covered in the map. Custom prepared products are kept separate and apart from products that are for sale. 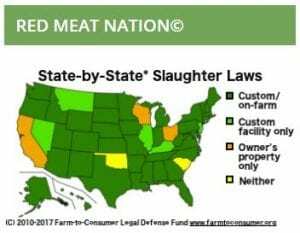 The state-by-state chart has greater detail on the laws regarding custom and on-farm slaughter in each state as well as a column indicating whether an unlimited number of owners is allowed for custom-slaughtered animals. Thanks to FTCLDF attorney Brandy McAllister for her work on this project.